The allure of 3-wheeled hoonage bursts from the skin of any Morgan Cyclecar like a fresh Botox bruise on the face of a Beverly Hills housewife. Sure, they might be getting up there in age and not able to keep up with the latest models, but fun is just a curve away if you can tame the wild beast. Unfortunately the cost of ownership of the real deal can be prohibitive, so getting a replica might do the trick. 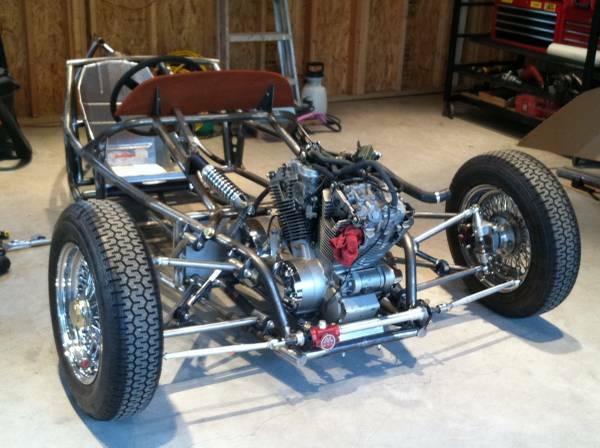 Find this undisclosed model year Morgan Cyclecar Replica offered for $3,000 in Elizabeth, CO via craigslist. Tip from Zach Z. You are not alone if you look at this pile of parts and think -- wow, that seems like a lot for $3,000, is this a scam? Frankly the only reason I'm inclined to believe this is real is because it has been posted for about a month on craigslist -- usually, scams get flagged within a few days...but then again, good deals get grabbed in a few days as well. 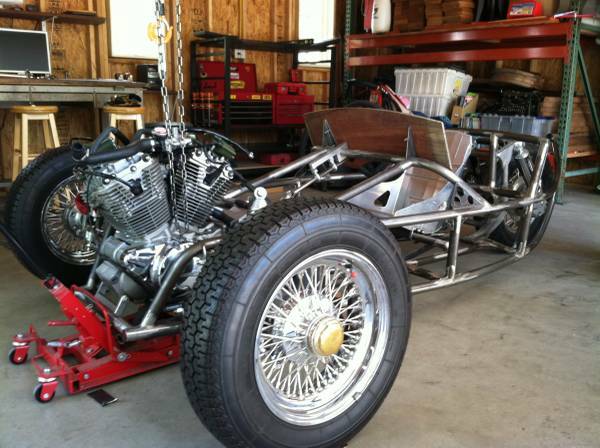 On the other hand, this 3-wheeler comes with an unknown history, probably no title (you'll need to figure that out with your local DMV) and it appears no sheet metal. But, if you are handy with an English wheel and a set of louver punches -- this could be on the road in no time. You might look at the engine orientation (above) vs. the real deal Morgan (below) and say "hey, wait...why is this V-twin turned 90 degrees?" 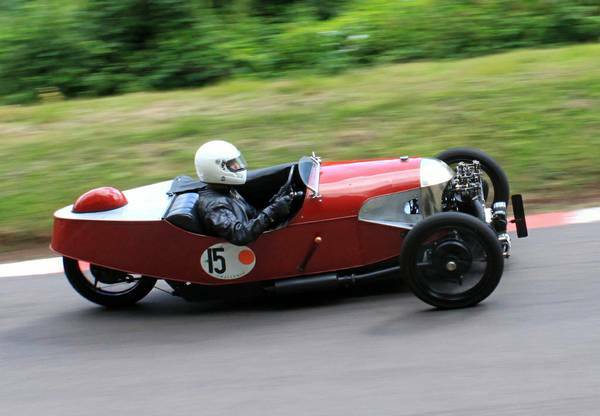 The difference is that the current Morgan / Ace design is set up to use a Harley or S&S type engine, with a separate gearbox mounted behind the longitudinal crank. The Honda VTX1300 in this replica uses a shaft drive in the original motorcycle, which is likely why the engine is oriented transversely here (like in the bike, with the crank running left/right). This also likely means that the replica uses the Honda motorcycle gearbox - no reverse! I've always loved the 3-wheeled Morgans, both original and reproduction. Not familiar with this design though. Is this one of a kind or is someone making a kit for this kind of drive setup? 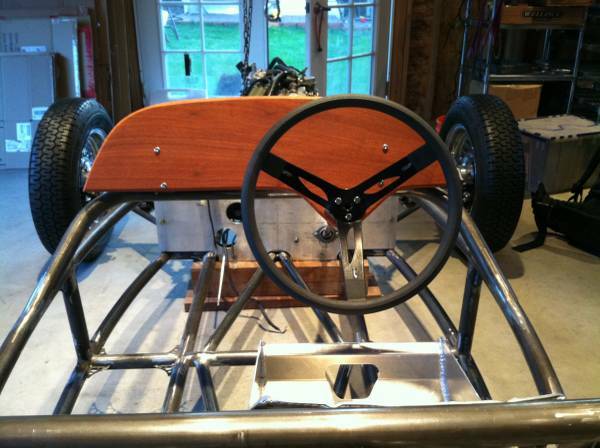 Agree on the front suspension/steering design. Easy to make a mistake with that. His welding looks good, and the finish looks nice. The dead-front image looks like I could almost blow it up and then calculate rolls centres, etc. But I'd still want to see his drawings. I've spent some time looking into tadpole three wheelers, and the key point where I disagree with many people is driven wheels. We've all read so many car magazines and books that we know rear drive is "best" for a four wheeled car. Well, with only three wheels, the rules go out the window. You want front drive. Front drive and sticky tyres, and it goes exactly where you point it. The rear wheel just holds the tail off the ground. Because it is a small light vehicle with a light engine and not much torque, you don't have significant torque steer problems to worry about. It looks fairly well designed from the photos provided. I can't see where the driveshaft is supposed to go, and there are no clear shots of the rear. But the front suspension looks good with its short/long A-arm setup and roll center between the chassis and the ground, from what I can tell. Bump steer seems like it would be minimal due to the rack's location coincident with the lower control arm and tie rod ends about the same length as the LCA. But seriously, thanks for those observations. So is this a kit or did someone just get really good with CAD and a welder? This thing looks beautiful, for what it is. From mfr. website- The Bespoke Motoring Experience of Vanderhall delivers a fitted accessory to motoring as extension of who you are.